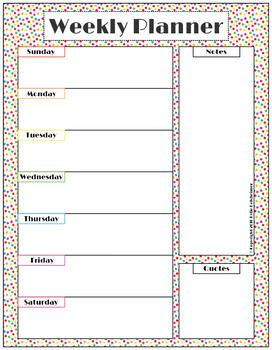 Organize your week with this simple but fun weekly planner. Each of the seven days of the week have a space for you to fill in all your to-do's. There is a space at the right side for notes and a space for quotes as well. Choose a new inspiring quote or Bible verse to motivate you each week! Teach students planning and time management by having each fill out this sheet, too. Download and print as many times as you need. This is for personal/classroom use and should not be redistributed.